The other day, I had taken Anoushka to our neighbour's house for a play date. When we were there, Sudhakar called me to tell me he was home. At 6 in the evening??? I was shocked. But indeed he was and that called for a celebration. And what better way to do it than to go out for a long dinner. 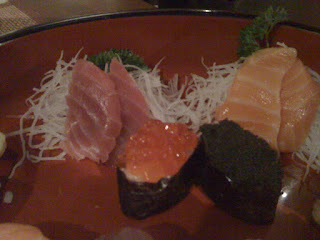 Sudhakar was in a major mood for sushi and so we decided to try out Harima. This is a Japanese restaurant, on the fourth floor of Devatha Plaza on Residency Road. For more familiar landmarks, Harima is in the same building as Casa Piccola, Casa Del Sol and Tiffany's. We had made a reservation and when we got there, it looked like it was a good thing to have done. 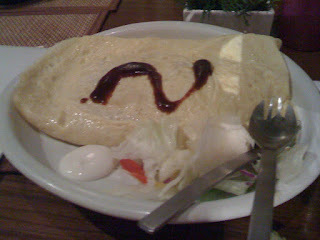 The place offers you the table and chair seating as well as the Japanese style of sitting on the floor at a low table. We opted for the table and chair considering Anoushka. The place offers wines and alcohol. The list is extensive and expensive. Sudhakar opted for a screwdriver while I decided to abstain for the day. The screwdriver he said, lacked any punch and he had some serious doubts on whether there was any vodka in it all. 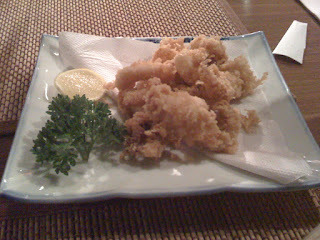 For starters we opted for the Ika No Karaage, which is squid legs fried in Karaage butter. Besides the fact that I didn't really think of squid having legs, the dish looked disappointing since it was a slightly varied version of calamari rings and had no accompanying sauces. 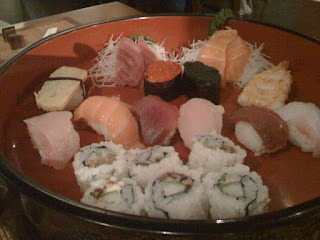 We had decided to go totally sushi and so did not want any sashimis and dimsums. The staff suggested we go in for the Harima special platter which comes with an assortment of 25 sushis, enough to fill our stomachs. And so the Harima platter it was. The platter comes with a mix of avocado roll, the california roll, red and black caviar, egg roll, the traditional vinegar rice combined with prawns, salmon, seaweed and other fish I am yet to familiarise myself with. 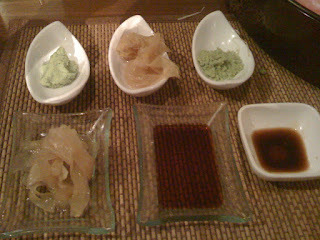 All of this was served up with juliennes of pickled ginger, wasabi (which packed a solid punch), soya sauce and sesame seed seasoning. The sushi more than made up for the not so pleasing starter. Our chopsticks could barely keep pace with us. For Anoushka was customised an egg wrapped chicken fried rice, which once again, was packed and brought home since my daughter was more fascinated with the white pebbles that made up the decor of the place. The entire meal cost quite a bomb and came to Rs 3417 bucks, tax included. 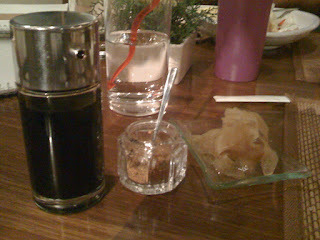 The only thing is that after we were done with the meal, we felt that there was nothing that we already had experienced in terms of sushi. 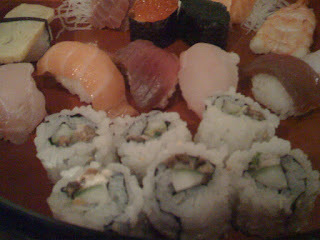 After having sushi at Soo Ra Sang and at East Winds, we have kinda burnt out on it. The place is nice, the food good and the loos really clean.